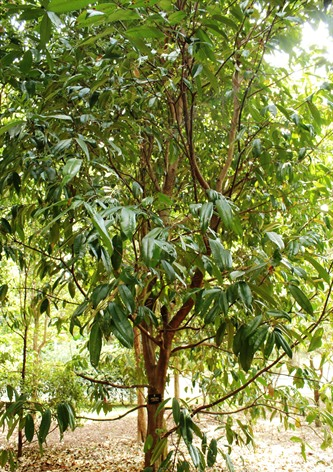 Jambu arang is a tropical plant growing chiefly in moist deciduous forests. 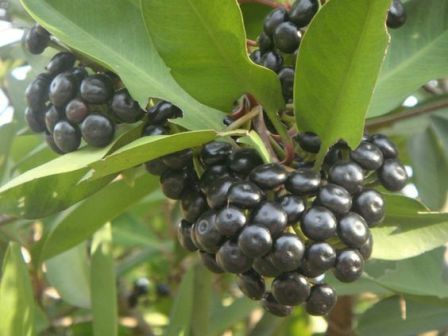 Though it bears edible fruits, but still it known more as medicinal plant because its use in herbal medicine. 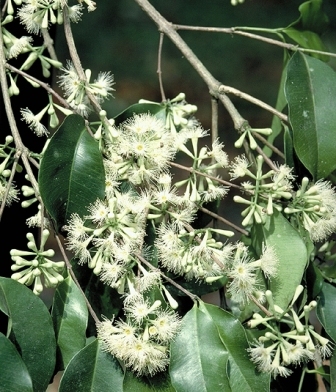 Its trees can be seen growing right from East India to upto Vietnam and also in some [parts of Australia. They grow mostly along the water streams upto an elevation of 1800 m. It is rarely seen in arid regions. A large evergreen tree upto 30 M tall, branches ascending to the main trunk. Leaves simple, opposite decussate, 5.4-17.8 by 2-7.5 cm, ovate or narrowly elliptic, apex acute or shortly acuminate, base attenuate, margin entire, blade leathery, glabrous on both sides, with numerous transparent dots visible against the light; midrib canaliculated above, primary vein single, pinnate, secondary veins oblique to the midrib, closely parallel, tertiary veins admedial, with single intramarginal vein, 1 mm from margin, petiole canaliculated and glabrous, stipules absent, fragrant. Inflorescence cymose, with short peduncle, calyx cup long, funnel shaped; flowers white-yellowish, sessile, grouped in terminal cymes with short peduncle, calyx cup long funnel shaped. Fruit a berry, smooth, glabrous, greenish with reddish tip. Jambu arang fruits have a sweet and sour taste with a touch of astringency. These are also watery. Tongue turns black after few fruits are eaten. The fruits make very good vinegar which is said to have great medicinal value. Wine is also made from the fruits. Jambo arang wood is strong and is also water-resistant. Due to this it is utilized in railway sleepers and also to install motors in wells. It is usually utilized to make inexpensive furniture and village houses although it is comparatively difficult to work on. The foliage is utilized as food for animals, since they have great nutrients and vitamins. The seed is utilized in numerous substitute therapeutic systems just like Ayurveda (to manage diabetic issues, as an example), yunani and also traditional Chinese medicine for digestive ailments. 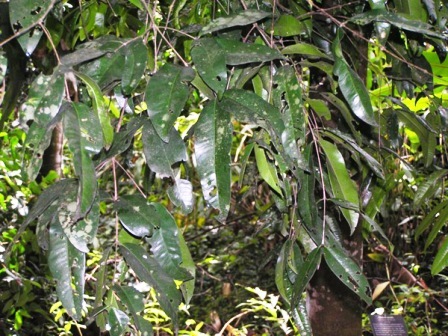 The leaves and also bark can be used for managing blood pressure level and also gum disease. Jambo arang fruits are collected from wild. This fruit has still not brought under cultivation. New plants can however be raised from seed as well as from cuttings.